I read and followed the instructions from mikeromo in his 9/16 posting but I still get an error -- a microdefs error. I reboot, run Live Update, download the virus defs, then it errors on the install. Everything else seems to have been installed. I even deinstaller and reinstalled. Having problems importing a 2nd graphic to this email (I get an 'An Unexpected Error has occurred. An Unexpected Error has occurred.' error.). So I have to type it all in: Vulnerability Protection Engine for Mac v1.3.0; Vulnerability Protection for Mac Latest; LiveUpdate for Mac v 5.1.1; Norton Antivirus for Mac v 11.0.3; Symantec Scheduled for Mac v5.0.3. Everything has a green check by it. Except for NAV for Macintosh Virus Defs. It has a red cirlce with white hyphen and the version says latest. But when I rerun LiveUpdate it says there is a later version. How do I resolve? Any help you can provide would be appreciated. Will you be posting a corrected installer so folks can avoid this unpleasant situation altogether? This might tell us more information. I am experiencing the same problem as the original poster. The version I am using is NAV for Macintosh 11.0.3 Corporate Edition. Live Update fails with the same error as above. Also, I have tried running the standalone definitions installer from the symantec site, which runs without any errors. However, the definitions date does not change. i am having the same issue, using NAV as part of norton internet security 4 for mac on os 10.5.8. Mine also says that NAV could not load the scan engine, and when i try to run a virus scan, it completes it instantly. autoprotect is also off, and it will not let me turn it on (gives a message that i should run liveupdate, which gives the microdefs error message). 4. When prompted, enter your computer user password. 6. Attach the generated SymantecInfo.txt file to your reply. Thank you both for posting your reports. I see that you are each running Mac OS on a volume that is formatted in case-sensitive HFS+ format. Unfortunately our products do not currently support that format. We are researching how to make our products effectively run on that format. 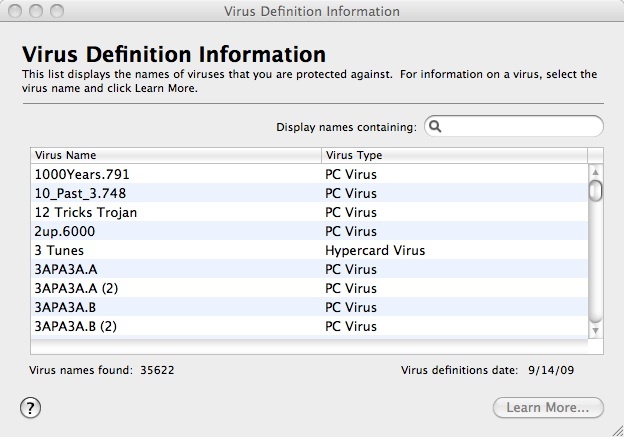 It may be best at this time to uninstall Norton AntiVirus from those volumes. If these are recent purchases of Norton AntiVirus, you can contact Symantec customer service for a refund. I reformatted the drive and reloaded Snow Leopard and NAV and everything works now. Thank you for taking the time to help me out. I am glad we could identify the problem. I personally stay clear of the case-sensitive HFS+ format because I don't need it and I know it can cause problems with other programs. Thanks for reformatting and sticking with us!